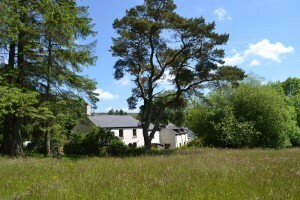 LOWER MERRIPIT COTTAGE – for your holiday in the wild heart of Dartmoor. 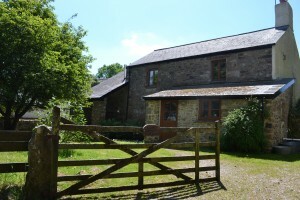 Lower Merripit Cottage is a large and secluded holiday cottage situated in the wild heart of Dartmoor. It was originally built in the 16th century as part of the ancient longhouse farm settlement of Lower Merripit that dates back over one thousand years. The cottage is in a very quiet location at the end of a lane, with undisturbed views down through a valley of woodland, peat bogs and meadows. There is a large garden that backs onto a wild flower meadow; from the cottage garden no other habitation is visible. The open moor may be reached by an ancient bridle way that crosses through the farm. The cottage is ideal for walking and family holidays on Dartmoor, as well as being suitable for small, quiet groups requiring a peaceful environment for workshops and retreats. Lower Merripit Cottage is within walking distance of the small village of Postbridge, 19 miles from Plymouth and 20 miles from Exeter. It is reached from the B3212 that traverses the centre of the moors. Lower Merripit Farm is a family small-holding where we have carried out extensvie work during the last 20 years to protect and enhance the land, which is rich in rare flora and fauna. Our growing methods are organic and sustainable, and we have been carrying out a long-term programme of planting native trees. We maintain two organic species-rich flower meadows which we harvest with a vintage tractor and bailer. The hay is used for the Irish cob horses that live on the farm, as well as our small Lower Merripit herd of wild ponies that graze on the hills above the farm. Buzzard, heron, tawny owl, badger, red deer, roe deer and other wildlife are regular visitors here. The stream carries salmon up to higher spawning grounds. Otter have been recently spotted in the stream lower down the valley after an absence of many decades. We run free-range hens for organic eggs and have an apiary of beehives at the farm, which produce honey sourced from the heather on the surrounding hills.